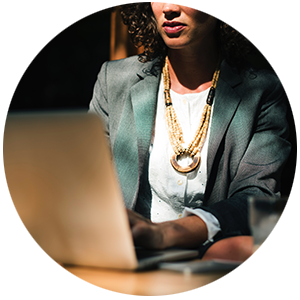 Reference Checks are one of the original and most widely-accepted background checks, having formed part of the recruitment process for decades. Traditionally, references sought to obtain subjective information regarding the character of an individual and now extend to verifying a candidate’s previous employment periods and/or their skills and experience that may be relevant to their role. Additionally, references are more investigative, seeking details of personal attributes of candidates that potential employers should be aware of, such as reliability, honesty and the way that they interact with others. When should you undertake a Reference Check? As a vetting tool to shortlist candidates. As part of the detailed background checking of selected candidates. When vetting large pools of candidates, such as graduate programs and call centers. When screening for senior roles, even if candidates are being sourced internally. What are the benefits of outsourcing Reference Checks? A key component for a reference checking program is to determine where the responsibility for undertaking the checks will lie. The advantages of outsourcing the process are most obvious in the time-savings of avoiding the management of what can be an administratively labourious process. The involvement of trained, objective PeopleCheck specialists that work to strict service level agreements without the competing internal deadlines that may impact employees in a recruitment or manager capacity undertaking the checks, can improve timeframes and in turn, hiring decisions. What type of Reference Check suits your business best? With developments in technology and varying ways that reference check results are utilised by organisations, PeopleCheck believes that there is no “one size fits all” when it comes to this crucial step in vetting your candidates. This being the case, PeopleCheck offers four different reference check products (detailed below). VirtualRefCheck is PeopleCheck’s online, completely automated reference checking solution. All communication with candidates and referees is facilitated via PeopleCheck’s online system, PRIVI. References are obtained online from the candidate’s nominated referees and provided in real-time. 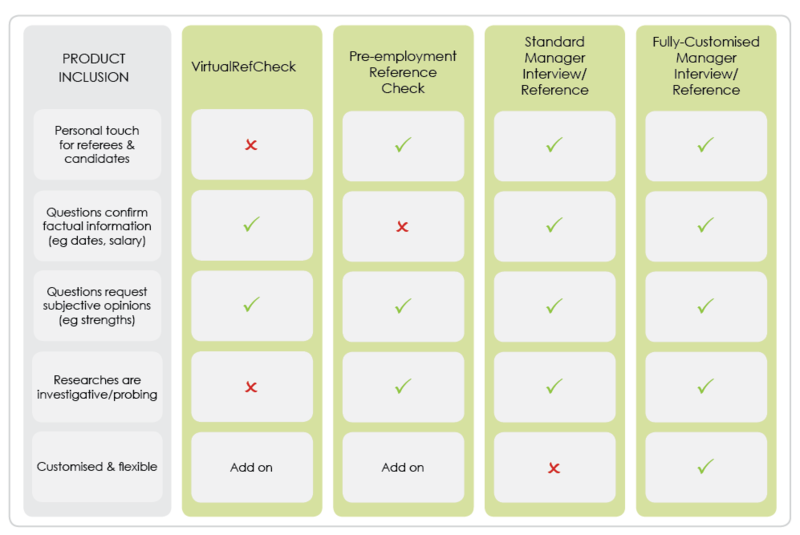 You can find out more about PeopleCheck’s VirtualRefCheck service here. An interview with the candidate’s referee is undertaken to verify employment and performance. This check includes pre-determined, standard questions. Questions can be added or customised for an additional cost. Candidates are contacted via our online system and assigned to a PeopleCheck Specialist to obtain referee details. Referee interviews are undertaken using a variety of methods, including telephone and/or email, with comments obtained verbally where possible.  This check involves a comprehensive interview with the candidate’s former manager, utilising PeopleCheck’s standard set of questions and an investigative approach. tailored question sets for specific individuals (e.g. for senior roles). Candidates are contacted via telephone and/or email to obtain referee details. Interviews are undertaken using a variety of methods, with comments obtained verbally where possible. Processes and reporting can be flexible, depending on requirements; and any discrepancies are clarified with the manager wherever possible. What does a Reference Check include? An account with PeopleCheck, with the option to request additional background checks as may be required, such as Police Checks, ID Checks, etc. Depending on the intended use of Reference Check results, they can be most effective when coupled with Employment Verifications. Please fill in the form below and we can assist you in determining which reference check best suits your organisation’s needs. Completing this form does not constitute a request for a background check. Our team only undertake background checks with full informed consent from the individual. Are you a person? * Please enter 2 characters. When undertaking a background check for one of our large utilities clients, a member of PeopleCheck’s Research and Investigation Group spoke with the CEO of a manufacturing organisation that the candidate had previously worked with. This Manager Interview / Reference uncovered that the candidate’s employment had been terminated because he had commenced his own business in direct competition to his employer whilst still working for the organisation. We were advised that the candidate had gone on to sue the organisation for unfair dismissal. However, when the matter was to go to court the candidate dropped all charges, due to the evidence that was held against him. Additionally, the referee advised that the candidate only worked for the organisation for two years and not nine years, as noted on his CV. This case study is an example of reference checks uncovering behaviour in a candidate’s past (such as a conflict of interest) that is directly relevant to a future employer, not to mention highlighting a huge gap in employment history.